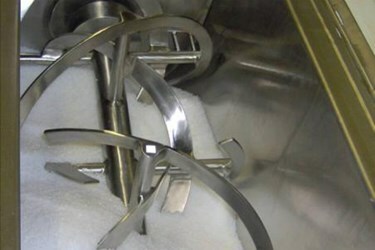 The Ribbon Blender is well-proven technology for fast and cost-effective blending of powders. Product is mixed within a U-shaped trough via a horizontal agitator consisting of inner and outer helical ribbons. The precise pitch on each ribbon produces a well-balanced axial and radial flow pattern. One important safety consideration surrounding this operation is the containment of powders during the blending cycle as well as during transport to and from the blender. Aside from a safety standpoint, proper powder containment also ensures consistent blend quality from batch to batch, easier clean-up and long equipment service life.